Much hydrogeological and groundwater information and many resources, including detailed maps, reports and other documents, are available for South Africa. This page provides a brief summary of hydrogeological understanding and groundwater resources in South Africa, and links to some of the many available resources. Please cite this page as: Ó Dochartaigh, Upton, Bertram, Pietersen, Abiye and Bellwood-Howard, 2018. South Africa. Map developed from USGS GTOPOPO30; GADM global administrative areas; and UN Revision of World Urbanization Prospects. For more information on the map development and datasets see the geography resource page. South Africa has a coastline of more than 2,500 km. The interior of the country is dominated by a large and mostly almost flat plateau with an altitude of between 1,000 and 2,100 m, which is highest in the east. This plateau is surrounded by the Great Escarpment whose eastern and highest area is known as the Drakensberg. There is a coastal belt below the Great Escarpment. There are a number of mountain ranges. Border countries Namibia, Botswana,Zimbabwe, Mozambique, Swaziland, Lesotho. South Africa's climate ranges from desert in the northwest, to subtropical in the east, but is largely temperate. Rainfall is highest - over 1,000 mm/year - on the southeast coast, falling towards the west to less than 200 mm/year in the Namib desert in the west. Temporal variations in temperature and rainfall are illustrated in the graphs below. 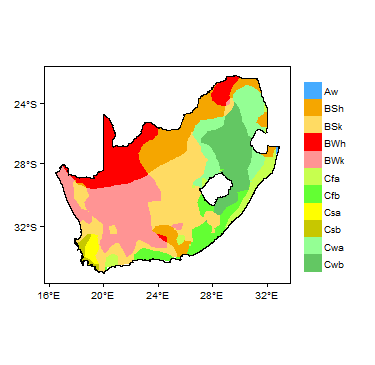 More information on average rainfall and temperature for each of the climate zones in South Africa can be seen at the South Africa climate page. Most rivers in South Africa are perennial. The largest rivers are the Limpopo river, partially shared with Zimbabwe, and the Orange river, which flows west to the Atlantic. Major surface water features of South Africa. Map developed from World Wildlife Fund HydroSHEDS; Digital Chart of the World drainage; and FAO Inland Water Bodies. For more information on the map development and datasets see the surface water resource page. Soil Map of South Africa, from the European Commission Joint Research Centre: European Soil Portal. For more information on the map see the soil resource page. 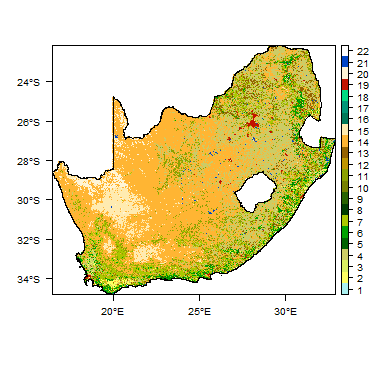 Land Cover Map of South Africa, from the European Space Agency GlobCover 2.3, 2009. For more information on the map see the land cover resource page. This section provides a summary of the geology of South Africa. Much more detail can be found in the references listed at the bottom of this page, some of which can be accessed through the Africa Groundwater Literature Archive. An Atlas country geology map has not been developed for South Africa, as higher resolution geology maps are already available. At the Council for Geoscience GeoPortal, you can view a 1:1 million scale geological map of South Africa. Quaternary - Tertiary Including Kalahari aeolian sands; and alluvial deposits in river valleys. Carboniferous to Triassic Karoo Supergroup. Consists mainly of sandstone, mudstone, shale and siltstone. Ordovician to Devonian Table Mountain Group and similar geological units. Dominantly arenitic, quartzitic sandstones. Including basalts of the Karoo Supergroup. Precambrian Crystalline metamorphic and igneous rocks. 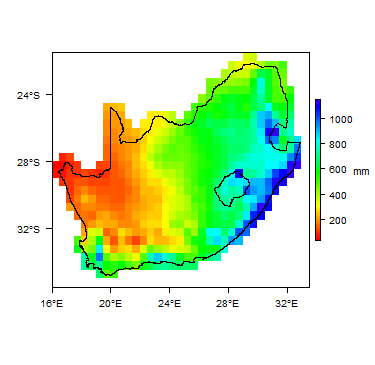 This section provides a summary of the hydrogeology of the main aquifers in South Africa. More information is available in the references listed at the bottom of this page. Many of these references can be accessed through the Africa Groundwater Literature Archive. 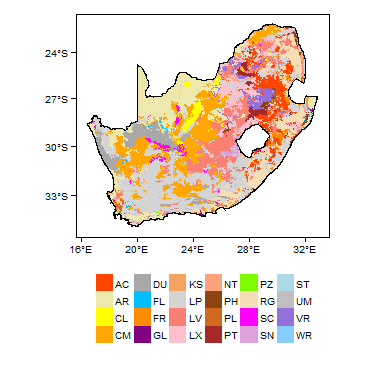 An Atlas country hydrogeology map has not been developed for South Africa, as many higher resolution hydrogeological and groundwater resources maps are already available. In particular, these include the Hydrogeological Map Series of 21 hydrogeological maps at 1:500,000 scale produced by the Department of Water and Sanitation (DWS), which covers the whole country. These show aquifer type (e.g. intergranular or fractured) and median borehole yield, with geology, rainfall and other information. These are available to purchase as hard copies from the Department of Water and Sanitation. A hydrogeological map of South Africa at 1:2,000,000 scale, also published by DWS, is available to view on the WHYMAP website. The DWS produces a set of national groundwater maps including an aquifer classification map, groundwater quality map, and aquifer vulnerability map. South Africa is also covered by the SADC hydrogeological map and atlas (2010), available through the SADC Groundwater Information Portal. Most aquifers in South Africa are in fractured rock domains. Most research has focussed on the main Karoo Basin aquifer and the dolomite aquifers. There is still much to learn about the hydrogeology of many of South Africa's aquifers (Pietersen 2004). Coastal sand, gravel and other unconsolidated sediments; alluvial sand and gravel in river valleys Typically shallow and unconfined. Usually less than 30 m thick. Typical yields in alluvial deposits are 3 to 8 l/s; typical yields in coastal sands are 3 to 16 l/s (Pavelic et al. 2012). Recharge rates are generally high. The aquifers are highly vulnerable. Karoo Supergroup An important aquifer in South Africa. Typically low permeability, particularly fine grained shale, mudstone and similar layers, in which groundwater flow is largely via fractures and other discontinuities, and storage capacity is limited (Pietersen 2004). Sandstone layers typically have dual permeability and have better groundwater potential. Pavelic et al. (2012) state that overall, the Karoo forms low to moderately productive aquifers, with typical borehole yields 1 to 3 l/s. Groundwater quality is variable. Most groundwaters have total dissolved solids (TDS) values between 450 and 1000 mg/l, with the highest values in the west and south of the basin (Pietersen 2004). Table Mountain Group An important aquifer. Groundwater often at more than 100 m depth; evidence for hot groundwater circulation at depths of up to 2000 m (Pietersen 2004). Groundwater is usually of Na-Cl type, with low pH, low hardness and low dissolved solids (Pietersen 2004). Dolomite Very important, particularly in northwest South Africa. The dolomite ranges from 200 to 1900 m thick. Karstic features are developed in the dolomite and they can form high yielding aquifers. Typical borehole yields are 20 to 50 l/s (Pavelic et al. 2012). Dissolution channels developed along fractures can extend to the ground surface, allowing direct recharge and groundwater flow (Pavelic et al. 2012). Vulnerable to pollution, because of thin soil cover and high permeability with rapid fracture flow. Volcanic rocks Little is known of the groundwater potential of these rocks. Intrusive igneous rocks Groundwater in these rocks occurs in fractures and weathered zones, both of which are often associated with major stuctural features, such as folds and faults; or with dykes. Water-bearing features are best developed in the uppermost few tens of metres. Groundwater quality is often affected by elevated fluoride (Pietersen 2004). Crystalline metamorphic and igneous rocks In these rocks, groundwater is found in the shallow weathered (regolith) zone in the uppermost few tens of metres of the rock - usually to a maximum of around 50 m depth (Pietersen 2004) - and/or in deeper fracture zones. Aquifer properties depend on the development of fractures and weathering. They generally form low productivity, local aquifers, with limited storage capacity. Borehole yields are typically low. Where they are overlain by unconsolidated aquifers, such as alluvium, groundwater in both aquifers can be hydraulically connected, increasing storage and groundwater potential. Groundwater quality is partially controlled by the products of weathering and by length of residence time, with groundwater in shallow, active aquifers typically having lower levels of mineralisation than deeper, slower circulating aquifer systems. Groundwater is dominantly of Na-Cl type. Nitrate concentrations can be elevated due to natural factors (Pietersen 2004). DWA (2010) reported an estimate of the total volume of available, renewable groundwater in South Africa (the Utilisable Groundwater Exploitation Potential, or UGEP) at 10,343 million m³/a (or 7 500 million m³/a under drought conditions. Current use is between 2,000 and 4,000 million m³/a of this groundwater (DWA 2010). Mining-related groundwater pollution is a major problem in parts of the country. A case study of acid mine drainage in Gauteng Province illustrates the problem and some of the measures being taken to combat it. Groundwater is widely used for rural water supply, particularly in the east of the country, and also for irrigation, particularly in the west. Current estimated groundwater use is between 2,000 and 4,000 million m³/a (DWA 2010). DWA reports that in 2013, about 65% of groundwater used in South Africa is used for agriculture: about 60% for irrigation and about 5% for watering livestock. Most of the remainder of groundwater used is by mining (about 13%), domestic water supply services in towns and cities (about 13%) and industry (3%). The final ~6% of groundwater is mainly used for rural water supply, which is mainly domestic, but also includes non-commercial gardening. Groundwater resources in South Africa were originally studied by the hydrogeologists of the Geological Survey, now the Council for Geosciences. 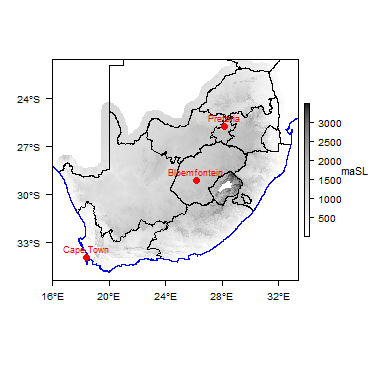 The Department of Water and Sanitation (DWS), the Water Resources Commission (WRC), and to a lesser extent the Council for Scientific and Industrial Research (CSIR) have produced major studies of groundwater conditions in South Africa. The DWS is the main implementer of the National Water Act, and through the Directorate of Surface and Groundwater Information, is responsible for, among other things, groundwater data acquisition and management and the development and maintenance of the main groundwater information systems for South Africa; carrying out regional monitoring; directing and carrying out groundwater resource assessments and exploration, including drilling; and evaluation and recommendations for water licensing. The DWS publish many reports and other documents relating to groundwater, including water resources status reports, and guidelines and standards for the development and management of groundwater. These can be accessed through the DWS website. One of these is the Groundwater Strategy 2010 report (DWA 2010). The DWS maintains an online National Groundwater Archive. In 2010 this contained records of about 250,000 groundwater sources (boreholes, wells, springs), including, where available, lithological, borehole construction, groundwater level and groundwater quality information. Another database, the Water Authorisation and Use database, stores information on volumes of groundwater used, based mainly on licensed volumes (DWA 2010). South Africa is one of the few countries in the world that enshrines the basic right to sufficient water in its constitution. However, much remains to be done to fulfill that right. The government recognises that more use could be made of groundwater resources, and the 2013 Water Resources Strategy included plans to better utilise them REF?. Protecting aquifers is now a priority, after a period when this received little attention, especially in the era when mining contributed largely to the economy (as seen in the Acid Mine Drainage case study).The National Water Act (Act 36 of 1998) recognised groundwater as a common asset (DWA 2010). The DWS has responsibility for groundwater level and quality monitoring. DWS operates various groundwater level and quality monitoring networks and systems. Groundwater data is reported in various ways, such as quarterly National State of Water Resources Reports (e.g. DWS 2014). - the Tuli Karoo Sub-Basin aquifer, shared with Botswana and Zimbabwe. The following references provide more information on the geology and hydrogeology of South Africa. They, and many others, can be accessed through the Africa Groundwater Literature Archive. The Water Research Commission (WRC) maintains the Knowledge Hub, a major online searchable archive of reports and other documents relating to water in South Africa. Council for Geoscience. 2003. Simplified Geology of South Africa, Lesotho and Swaziland. Map compiled by CJ Vorster. Department for Water Affairs (DWA). 2010. Groundwater Strategy 2010. Department of Water Affairs, South Africa. Department for Water Affairs (DWA). 2013. National water resource strategy. Water for an equitable and sustainable future. Republic of South Africa Department for Water Affairs. DWS. 2014. The National State of Water Resources Quarterly Report July to September 2014. Prepared by: Directorate: Water Information Programmes; Chief Directorate: Water Information Management. Nyabeze P, Saeze H, Yibas B, Tekere M, Tshibalo AE, Venter JS, Olivier J, Jonker CZ, Sekiba M & Motlakeng T. 2013. The geological and biological hot spring scene in South Africa. Chapter 2, 15 –35. In: Olivier J and Jonker N (Eds) Optimal Utilisation of Thermal Springs in South Africa: Project No:K5/1959: Report to the Water Research Commission, UNISA, WRC Report No. TT 577/13, 144 Pages. Pavelic P, Giordano M, Keraita B, Ramesh V and Rao T (eds.). 2012. Groundwater availability and use in Sub-Saharan Africa: a review of 15 countries. IWMI, Sri Lanka, 2012. Pietersen KC. 2004. A Decision-Making Framework for Ground water Management in Arid Zones (with a Case Study in Namaqualand). Unpublished PhD thesis, University of the Western Cape. SADC. 2010. Technical Assistance to the SADC - 'SADC Hydrogeological Mapping Project' (9 ACP RPR 39-89); Final Report. Southern African Development Community European Development Fund, HGM-1, March 2010; a technical report to the Southern African Development Community (SADC) and Cooperating Partners: European Union and GTZ. Seward P, Xu Y and Turton A. 2015. 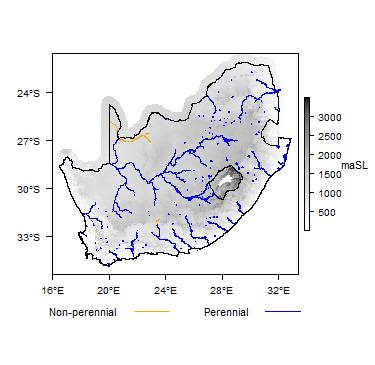 [http://www.tandfonline.com/doi/abs/10.1080/02508060.2015.1036390 Using backcasting to explore ways to improve the national water department’s contribution to good groundwater governance in South Africa]. Water International 40(3), 446-462. DOI: 10.1080/02508060.2015.1036390. Statistics South Africa. 2015. Statistical release P0318: General Household Survey 2015. Tshibalo AE, Dhansay T, Nyabeze PK, Chevalier L, Musekiwa C and Olivier J. 2015. 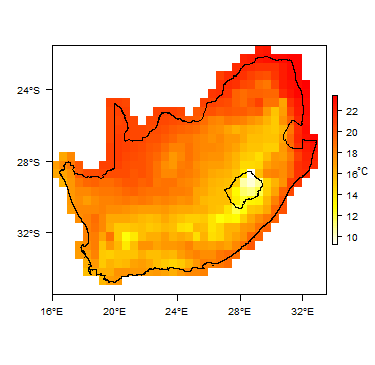 Evaluation of the Geothermal Energy Potential for South Africa. Proceedings World Geothermal Congress 2015 Melbourne, Australia, 19-25 April 2015. This page was last modified on 13 March 2019, at 11:48.